1. Preheat oven to 400°F. Spray 12 cup muffin tin with nonstick spray or line with paper bake cups. 2. In a medium bowl, whisk together the dry ingredients (through salt). 3. In a large bowl, beat together eggs, apple butter, melted butter and vanilla. Add dry ingredients to wet mixture all at once. Stir just until moistened (the batter will not be smooth). Spoon batter into prepared muffin tin, filling each almost full. 4. Mix topping- sugar and allspice. Sprinkle topping onto each muffin. 5. Bake 18 - 20 minutes, or until toothpick inserted in center comes out clean. Cool in muffin tin on wire rack for 5 minutes. 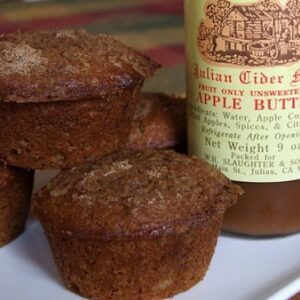 Remove from muffin cups and serve warm. Great way to use up some apple butter. I mistakenly mixed up the measurements of the baking powder and baking soda but these muffins still turned out delicious. I just made some apple butter. 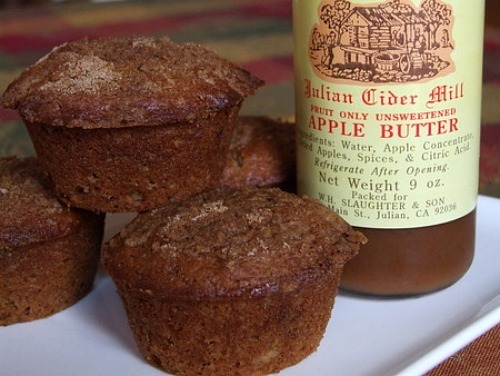 Now I’m going to make these delicious muffins to share at our last Garden Gate of the season. We have had a wonderful Apple Harvest this year! Happy Thanksgiving……. I would have liked them to be a little more dense, could possibly adjust the dry ingredients a bit. The flavor was great!